Boston – Tuesday, November 14, 2017 - The Boston Planning & Development Agency today announced new project timeline pages on the agency’s website, along with the launch of a new Developer Portal which will allow developers to electronically submit all project data and documents. Over the coming weeks BPDA development project web pages will be updated to include the new project timeline feature. The revamped pages will utilize a timeline feature to display key milestone dates, documents, events, pictures, and public comment forms. The timelines will read from top to bottom, with the most recent events first. The timeline can also be sorted depending on the viewer’s preferences and can be filtered by documents, milestones, events, and more. For example, a quick events filter has the ability to show constituents all the public meetings that occur within the Article 80 process for any given project. Additional data will also provide snapshots of the project as it changes throughout the community process and BPDA recommendations. Pictures of renderings and construction can also be displayed as the project is being developed. Project timelines will also feature a comment period milestone. When the comment period is open, this milestone will have a special link that will provide the user with a comment form link so that they can submit an opinion along with a detailed comment. Example timelines can be viewed for the 1000 Boylston and 75-85 Liverpool Streetprojects. In tandem with the new timelines, the new Developer Portal will help to streamline processes and create transparency and efficiency for both BPDA staff and developers. Developers will be required to submit their materials through the portal and once they do, they will receive automated emails as their projects progress through the Article 80 process. The new online process will decrease data entry for BPDA project managers, creating a smaller margin of error for project data. Upon developer submission, a project manager will review all data and approve or reject all changes in the database. All approved data changes will be published on the project page for the public to view, alerting the public about project updates faster than ever before. The Developer Portal is the second phase of the BPDA’s efforts to increase the quality and transparency of the agency’s data. In 2016, the BPDA’s Management Information Systems (MIS) division migrated all data to Salesforce in order for the agency to produce and maintain better quality data and create automated workflows. 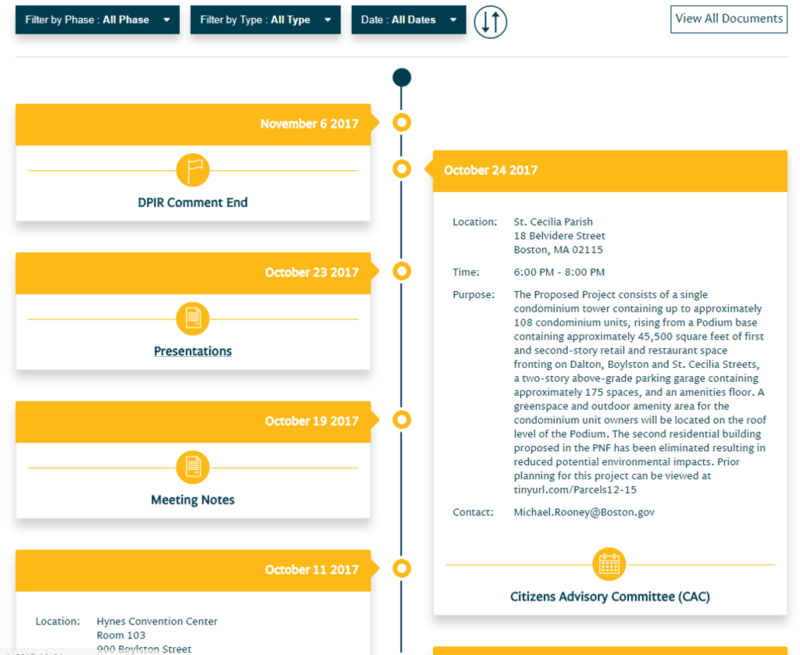 Both the new timeline feature and Developer Portal are the results of the BPDA’s efforts to design new systems, processes, tools, and communications to address these four areas of focus, following the agency’s new organizational identity: Engage Communities, Implement New Solutions, Partner for Greater Impact, and Track Progress.